In front of the Icecap tower at the NNSS. This year marks the 60th anniversary of the U.S.–U.K. Mutual Defense Agreement (MDA), which provides for the exchange of defense information relevant to nuclear weapons, naval nuclear propulsion, and nuclear threat reduction. On July 3, 1958, U.S. Secretary of State John Foster Dulles and British Minister Samuel Hood signed the Agreement between the Government of the United Kingdom of Great Britain and Northern Ireland and the Government of the United States of America for Cooperation on the Uses of Atomic Energy for Mutual Defense Purposes. The MDA is a cornerstone of our nuclear deterrent and ensures the security of both the United States and United Kingdom. 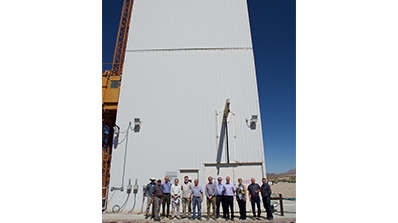 To commemorate the event, several guests from the Atomic Weapons Establishment (AWE), British Ministry of Defence, and British Defence Staff from the British Embassy in Washington, D.C., visited the Nevada National Security Site (NNSS) Sept. 19. The visitors were able to see first-hand some of the current work taking place at the Site. A special stop was made at the Icecap tower, the site of a U.S.–U.K. underground nuclear test scheduled for the spring of 1993, but halted by the Underground Nuclear Testing Moratorium. 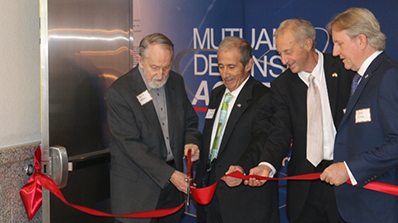 A reception and dinner also took place Sept. 20 at the National Atomic Testing Museum to mark the opening of a temporary MDA 60th anniversary exhibit. Notable guests included two former Department of Energy undersecretaries for nuclear security and administrators of the National Nuclear Security Administration, Ambassador Linton Brooks and Tom D’Agostino, both of whom spoke about the continued importance of the U.S.–U.K. partnership. Exhibit ribbon-cutting with Nevada Test Site Historical Foundation (NTSHF) Chair Emeritus Troy Wade, NTSHF Vice President Chuck Costa, and AWE’s Peter Sankey and Steve Fisher. AWE Senior Technical Adviser Peter Sankey also shared remarks, and Dr. Richard Moore, AWE historian, gave a presentation on the history of the MDA following the exhibit ribbon cutting. The exhibit is on display in the museum’s theater through the end of the year. U.S. presidents from Eisenhower to Clinton seriously considered how to limit or stop nuclear explosive testing as part of arms control. With the end of the Soviet Union, President George H.W. Bush halted the development of new nuclear weapons. In 1993, President Clinton announced: “To assure that our nuclear deterrent remains unquestioned under a test ban, we will explore other means of maintaining our confidence in the safety, the reliability, and the performance of our own weapons.” Those “other means” became the Science-Based Stockpile Stewardship (SSBS) program. Despite some political and technical bumps, SSBS has been successful for 25 years and remains the basis for the nuclear weapons strategy as described in the 2018 Nuclear Posture Review. The development of subcritical experiments (SCE) at the NNSS has taken on a central role in maintaining our confidence in the safety, reliability, and performance of our own nuclear weapons for an uncertain future. “Integral SCEs are central to future SSBS [programs]. [That is the] U.S.’ nuclear deterrent strategy,” according to Dr. Reis. 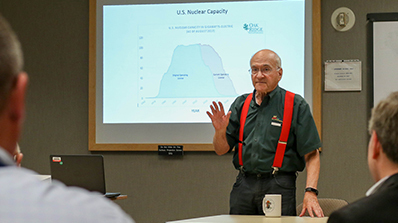 A question-and-answer session addressed challenges of the nuclear scenario and Dr. Reis’ own experiences. 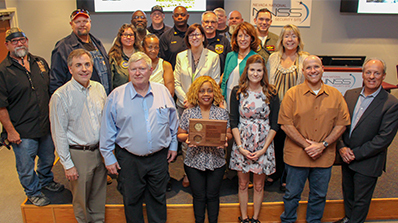 The National Nuclear Security Administration (NNSA)'s Office of Safety, Infrastructure and Operations recently visited the Nevada National Security Site (NNSS) North Las Vegas Facility to present awards to employees for their work on the NNSS’ immense infrastructure program. 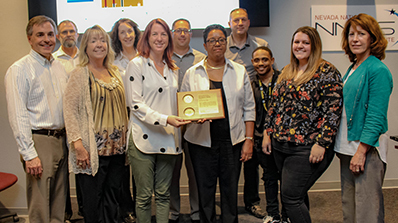 These employees were recognized for outstanding accomplishments involving innovation, effectiveness, teamwork, overcoming adversity and enabling future success. 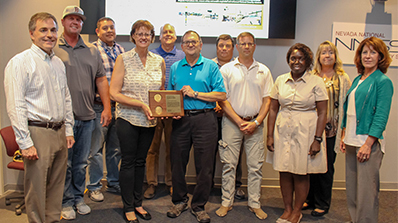 Sheila Feddis, deputy director of the Infrastructure Operations & Modernization Office and Recapitalization program manager, presented the awards. Joining her were Nevada Field Office (NFO) Assistant Manager for National Security Laura Tomlinson, NNSS management and operating contractor Mission Support and Test Services’ Program Integration Senior Director David Feather, and Enterprise Infrastructure Programs Director Joel Leeman. 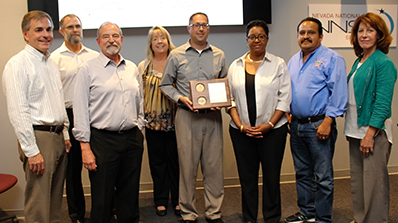 NFO Deputy Manager Juan Griego thanked Feddis for coming and recognizing the NNSS team for the gains made and the great accomplishments in modernizing the site’s infrastructure. To help extinguish a recent wildland fire in the NNSS' remote Area 19, more than 100 water drops were made by helicopter crews from the NNSS' own Remote Sensing Laboratory (RSL) at Nellis Air Force Base. This video provides an up-close and personal look at how these operations were planned and executed safely by NNSS Fire & Rescue and the RSL pilots. Thanks again to all of our first responders for their hard work fighting this fire. NNSS employees hear from Secretary Perry during an all-hands meeting. 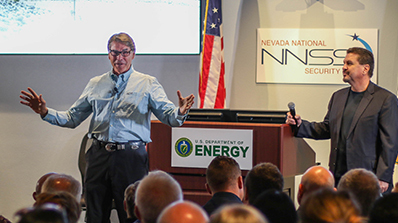 U.S. Secretary of Energy Rick Perry visited the Nevada National Security Site (NNSS) Aug. 22-23. 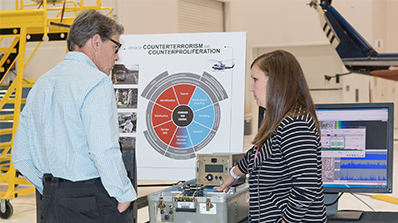 On Wednesday, Aug. 22, Perry toured the Site itself, speaking with employees and visiting locations of high importance to the NNSS’ national security mission. 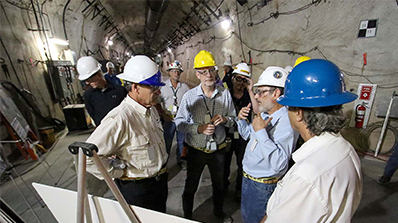 Highlights of his tour included the U1a Complex, an underground laboratory used for subcritical experiments, and the Site’s most secure facility, the Device Assembly Facility (DAF), which supports subcritical experiments, special nuclear material staging and emergency response training. Perry was particularly impressed with the NNSS’ work with NASA and Los Alamos National Laboratory on the Kilopower experiments, or KRUSTy (Kilopower Reactor Using Stirling Technology). Secretary Perry (left) is briefed at the NNSS' U1a Complex. 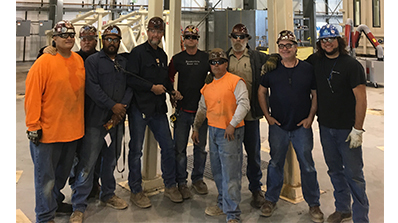 On Thursday, Aug. 23, he joined employees from throughout the Nevada Enterprise for an all-hands meeting at the NNSS’ North Las Vegas Facility and, in the case of remote locations, via video teleconference. Perry began his talk with a little background on himself and how his career led to his position as U.S. Secretary of Energy, which he described as the “coolest” job he’s ever had. “What the Department of Energy is involved with changes the world,” he said. He went on to talk about his tour of the Site and the work he observed. The Energy Secretary learns more about the RSL mission. Keeping America safe is “the highest calling of what we do,” he said. Perry also made special note of the efforts of the many employees involved in fighting the NNSS’ recent Area 19 wildfire, which burned just over 2,200 acres in a remote, mountainous section of the Site. He closed his all-hands by taking questions and thanking everyone for their work. Afterward, he took the time to speak with and shake the hand of every employee who waited. Perry completed his visit to the NNSS with a tour of RSL-Nellis, the NNSS’ West Coast Remote Sensing Lab, which has served for more than 50 years as a valuable national asset for nuclear emergency response and remote sensing capabilities. 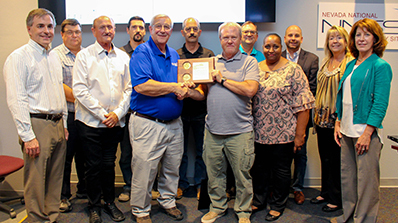 The July 18, 2018 NSSAB meeting, held in Pahrump, Nevada, was noted by John Klenke to be one of the best-attended by private citizens during his nine years of participation. Those who provided public comment were focused on the safety of groundwater contaminated by historical nuclear testing activities at the NNSS. Klenke and the public commenters also expressed their appreciation to DOE for conducting the meeting in Pahrump. To view minutes of the July NSSAB meeting and others held in 2018, visit the NSSAB website at: www.nnss.gov/NSSAB/pages/MM_FY18.html. In July, Nye County announced no tritium was detected in groundwater samples collected in late 2017 from 20 wells in communities down-gradient of the Nevada National Security Site (NNSS). 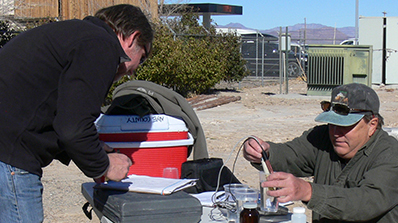 The 2017 Tritium Sampling and Monitoring Program (TSaMP) results were shared by Nye County during a Nevada Site Specific Advisory Board (NSSAB) public meeting and at the Community Environmental Monitoring Program (CEMP) Workshop. 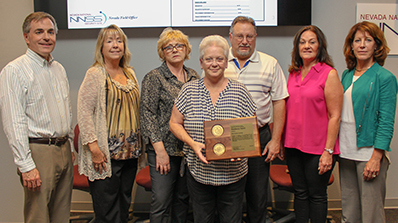 The TSaMP is funded by a Department of Energy (DOE) grant and results are published in the annual NNSS Environmental Report as well as by the Pahrump Valley Times. The announcement during the July 18 NSSAB meeting was made by John Klenke, a liaison member of the NSSAB representing the Nye County Nuclear Waste Repository Project Office, who was “happy to report that the 2017 results showed no tritium hits.” Klenke further noted that Nye County has been conducting the independent TSaMP since 2015, sampling wells in Amargosa Valley, Beatty and Lathrop Wells. The week following the NSSAB public meeting, Klenke presented an update on the TSaMP at the CEMP Workshop, an event held for Community Environmental Monitors (CEMs) – residents that manage DOE-funded monitoring stations in their communities. Klenke’s briefing included sampling results for 10 wells in 2015, 20 wells in 2016, and 20 wells in 2017 – all of which showed no detectable levels of tritium. As Nye County prepares for the 2018 sampling campaign, Klenke solicited input from the CEMs on priorities, locations, and CEM participation. CEM feedback is expected by mid-September. John Klenke (right) and Jamie Walker with Nye County sample a well in Amargosa Valley. Klenke anticipates that 2018 sampling will occur from mid-October through the first week in December so that samples can be shipped to the independent laboratory for analysis before the holidays. To ensure the validity of, and increase public confidence in, sampling results, Nye County collects some duplicate samples and sends “blank” samples to the lab. In 2017, a total of 27 samples were analyzed to meet quality assurance requirements. 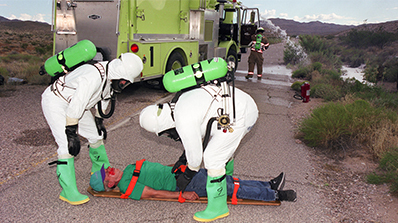 Twenty years ago, the Nevada National Security Site’s Counter Terrorism Operations Support (CTOS) program trained its first emergency responders on how to respond to radiological and nuclear threats. To date, CTOS has trained a total of 220,900 first responders! There is no doubt that CTOS training has substantially contributed to national preparedness, ensuring the nation’s first responders are ready to successfully handle events involving radiological or nuclear terrorism. Creating a program like CTOS was critical. Immediately following the 1995 Oklahoma City bombing, first responders were unprepared to deal with weapons of mass destruction. Soon after, the National Domestic Preparedness Consortium (NDPC) was formed – originally under the Department of Justice before it eventually found a home under the Federal Emergency Management Agency (FEMA). With state and local agency training budgets constrained, NDPC made the case for a national training program. As a result, CTOS was born. “CTOS stresses that first responders should train as if their life depends on it, because it does,” said Dave Pasquale, CTOS project manager. 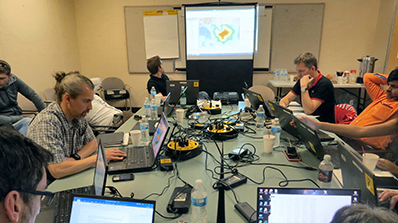 The CTOS team continually adjusts its parameters to be in line with real-world scenarios. They use the services of more than 80 instructors – subcontractors who are current or retired law enforcement, military, fire and emergency medical services professionals, allowing the right instructor to teach the right audience (such as police officers teaching police officers). Training and course materials are provided at no cost to eligible participants. The program also recently debuted its first Spanish online course. CTOS instruction is performance-based and uses multiple types of radioactive material, controlled in a safe and secure manner. Operating and employing radiation detection and measurement instruments throughout the course, participants train with radioactive material in the classroom, scenario-based drills and performance evaluations. And what better place to train for radiological/nuclear events than at a historic site that conducted 928 nuclear experiments? The small amount of nuclear fallout remaining from these detonations is now below the surface of the soil at the T-1 Site at the NNSS. Formerly known as the Nevada Test Site, the Site’s entrance is located 65 miles northwest of Las Vegas. This provides a realistic and safe training area today. The soil at the T-1 Site emits low levels of radiation, which simulates widespread radiological contamination from an improvised nuclear device or multiple radiological dispersal devices, yet poses minimal risk to participants. (Courses are designed so participants receive only minor radiation doses—lower than a chest X-ray or a typical round-trip airline flight across the United States.) Fortunately, even low levels of radiation are sufficient to learn techniques required in an actual incident involving much higher radiation levels. 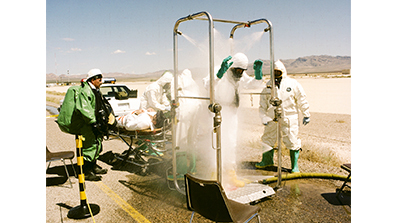 First responders test for radiation in a 2017 class. Adding to the realism, radioactive debris created during the nuclear tests, such as twisted steel fragments and sand melted into radioactive glass (trinity glass or trinitite), are still scattered throughout the T-1 Site. 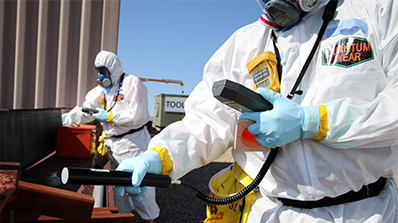 Industrial, sealed radioactive sources are also placed in exercise areas to create higher levels of radiation as needed for training objectives. All training goes through a certification process with FEMA and is National Incident Management System (NIMS)-compliant, which standardizes the incident command process, allowing professionals from other areas to easily integrate as needed. To learn more about the CTOS program, please enjoy this video: https://www.youtube.com/watch?v=1BsnbDYKUnM&t=9s or visit our CTOS webpage. 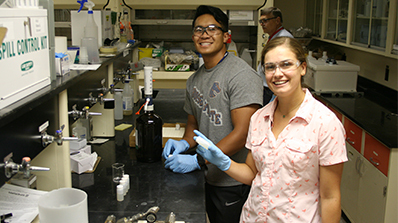 Ralph Carios (center) and Kendall Thomas prep vegetation distillate samples in the Ecological and Environmental Monitoring lab. Interns from the U.S. military have come to the NNSS each summer to learn civilian skills they can apply in their military careers. This summer was no different as cadets and midshipmen from the U.S. Air Force Academy (Colorado Springs, Colo.), Military Academy (West Point, N.Y.) and Naval Academy (Annapolis, Md.) worked on a variety of missions at the NNSS. Besides being Air Force Academy cadets, Kendall Thomas and Ralph Carios have quite a bit in common: They’re biology majors intent on graduating next May, have a medical background, and conducted biological research with the Site’s Ecological and Environmental Monitoring group. The only difference: Kendall is aspiring to earn her master’s and eventually be an Air Force nurse, while Ralph has his eye on the sky as a pilot. Kendall and Ralph worked on data collection that was included in the NNSS Environmental Report, such as tracking released and resident desert tortoises. They also conducted plant and air sampling and genetic sequencing to indicate population densities of resident species at the Site. Kendall and Ralph were inspired by the NNSS scientists. “It is exciting to see that everyone we work with enjoys their daily job and the impact it has on the NNSS,” Kendall said. Thomas Weatherford explores one of the AMS helicopters during his internship at RSL-Nellis. West Point’s Thomas Weatherford is majoring in nuclear engineering. Thomas says he aims to have “a real-life glimpse on the applications of nuclear technology and research.” Specifically, his long-term goal with his major is to dig deeper into nuclear reactors and nuclear power. He interned at the Remote Sensing Laboratory-Nellis with their Aerial Measuring System (AMS) group. He also attended the U.S Department of Energy Office of Aviation Management’s 25th Annual Aviation Safety Workshop and 6th AMS International Technical Exchange that included a guided tour of the NNSS. 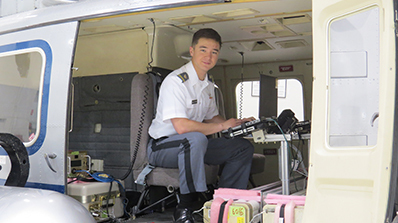 After graduation, Thomas will work toward a career in flying Blackhawk helicopters that, combined with his nuclear engineering degree, would make him an ideal future AMS scientist. “Thomas was afforded the opportunity to research the various radiological detection systems we provide in keeping the nation safe, as well the support of the emergency response mission,” says NNSS Senior Principal Project Manager Von Sudderth, who oversees the internships. 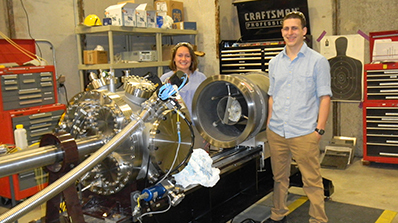 Navy midshipmen Fallon Bowes and Joshua Monge interned at the NNSS’ North Las Vegas Facility, performing research on the C3 gas gun. The two looked at shock physics experimentation on materials via impact physics to validate computational models. (This foundational research is provided as a stepping stone to the much larger, two-stage gas gun, the Joint Actinide Shock Physics Experimental Research (JASPER) facility). Fallon Bowes (left) and Joshua Monge pose with the C3 gas gun. In the first job of her military career, Fallon will be working on surface vessels. Joshua will attend submariners’ school and then will transition to submarine duty after he graduates at Annapolis. The Department of Energy’s National Nuclear Security Administration (DOE/NNSA) recently completed the first underground, chemical explosion in the second phase of the Source Physics Experiment (SPE), which is designed to advance the United States’ ability to detect underground nuclear explosions. The SPE is a multiphase campaign using buried explosives to generate seismic and acoustic signatures similar to those emitted by an underground nuclear detonation. “The data collected from the SPE trials strengthen our national security by advancing technical solutions for treaty monitoring and improving computer simulation methods used to evaluate potential explosions anywhere in the world,” said Dr. Brent K. Park, NNSA’s Deputy Administrator for Defense Nuclear Nonproliferation. Research teams from Nevada National Security Site, Los Alamos National Laboratory, Lawrence Livermore National Laboratory, Sandia National Laboratories, and the University of Nevada-Reno collected information and measured the unique signatures generated by this experiment. Scientists used high-resolution accelerometers, seismometers, infrasound sensors, and high-speed video to collect data. This second phase of the SPE campaign is expected to conclude by May 2019. A total of four experiments are planned as part of this phase. Seismic data collected from the SPE experiments are made available to researchers around the globe for analysis via the Incorporated Research Institutions for Seismology website at http://www.iris.edu/hq/. 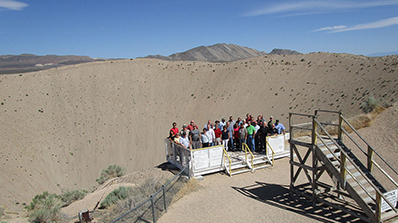 Workshop participants visit the Site's iconic Sedan Crater. So said Department of Energy (DOE) Aviation Program Analyst Patricia Hagerty of the DOE Office of Aviation Management’s 25th Annual Aviation Safety Workshop, held for the first time ever in Las Vegas. More than 50 members of the DOE aviation community flew in from across the country and gathered at the Nevada National Security Site’s (NNSS) North Las Vegas Facility to discuss the takeoff for this year’s workshop. Proud to host the workshop, Nevada Field Office Manager Steven Lawrence discussed what makes the NNSS the ideal place for it. “What’s most unique about Nevada and the Nevada National Security Site is the fact that we have more than 1,350 square miles of our own airspace,” Lawrence said. In addition to helping attendees meet their annual training requirements, the workshop is also an opportunity to discuss safety, new policies and directions – as well as connect or reconnect with friends and fellow workers. 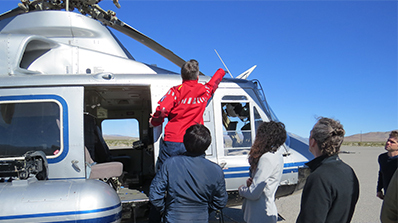 The recent three-day workshop included a tour of the Remote Sensing Laboratory-Nellis and the NNSS, along with a visit to the Desert Rock Airstrip. 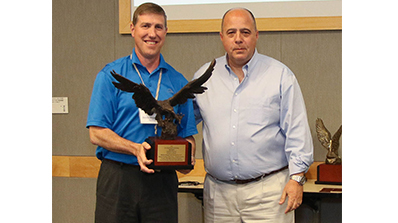 Donnie Schuessler (left) accepts the NNSS' award during the workshop. Other awards given included: the U.S. Department of Energy Aviation Management/Safety Professional Commercial Aviation Services Program, awarded to Gus Fadel, Office of Science Oak Ridge Office; the U.S. Department of Energy John Cooley Aviation Operations/Support Professional Memorial Award, given to Mark Arnholt, director of operations – pilot, Aviation Operations Division Office of Secure Transportation and the National Nuclear Security Administration; the 2017 U.S. Department of Energy Aviation Safety Professional, given to H. Scott Spindler, safety officer – pilot, Aviation Operations Division, Office of Secure Transportation and the National Nuclear Security Administration; and the Aviation Management Professional Award, given to William “Bill” Duncan, supervisory aircraft pilot – Director of Operations, Bonneville Aircraft Services, Bonneville Power Administration. 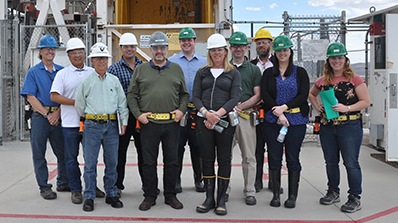 NNSA’s Robin Noyes (center) and her team, Defense Programs Office of Recapitalization, and the NNSS cadre toured the U1a Complex before heading to Area 6. National Nuclear Security Administration (NNSA) headquarters’ personnel, led by Robin Noyes of the Defense Programs Office of Recapitalization, recently visited Nevada National Security Site (NNSS) facilities in Southern Nevada, as part of the Capabilities Based Investments (CBI) Program Review for the NNSS. The CBI Program has helped the Site in numerous ways, and the NNSS wanted to show how the mission is benefitting from their investments. “The CBI Program funds projects across the NNSS and its outlying locations. This is important because the CBI Program recapitalizes mission capabilities supporting national objectives set forth by the NNSA for present and future investments, and is critical to the success of our mission for national security,” says Dimitry Molodyko, Mission Facilities manager of Enterprise Infrastructure Programs (EIP). The EIP, a division within the NNSS’ Program Integration directorate, works with the Nevada Enterprise to modernize and enhance the NNSS infrastructure to meet future national security challenges. The first day of the NNSS tour included the U1a Complex, Building 6-922 (former home to the Atlas Machine) in Area 6, the Dense Plasma Focus (DPF) Facility in Area 11, and the Device Assembly Facility. 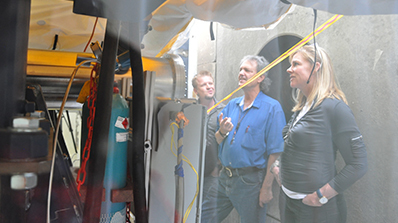 NNSS subject-matter experts were able to demonstrate progress across a range of projects that NNSA has funded, including the Atlas Transition Project in Building 6-922. The group gained further details of the Atlas machine’s removal to make room for the next mission, Scorpius, an ECSE (Enhanced Capabilities for Subcritical Experiments) project whose components will be fabricated at Los Alamos National Laboratory (LANL). 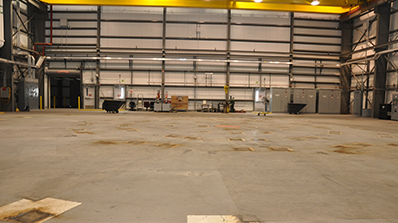 The components for Scorpius will be transported to Building 6-922 in 2021, where they will be inspected, tested and configured for assembly underground at the U1a Complex. Right now, the NNSS is working with LANL, Sandia National Laboratories and Lawrence Livermore National Laboratory on Scorpius’ engineering design. Test and Experiment Management Principal Engineer Nathan Sipe (left), with James Gatling, gives Robin an up-close introduction to the DPF facility in Area 11. “The purpose of the Scorpius ECSE machine is to take pictures of a subcritical experiment as it is imploding. Scorpius is designed to be different from existing machines at U1a, in that it would be more powerful, creating X-rays for a camera sitting off to the side to record the implosion. 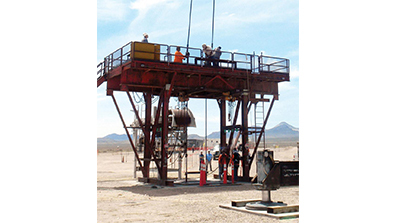 These pictures will help validate stockpile, reliability and computer modeling codes without performing underground nuclear tests,” says James Gatling, distinguished engineer for NNSA Programs. On the second day, the Program Review included briefings and additional tours of the Standards & Calibration Laboratory and the A-1 Machine Shop at the North Las Vegas Facility, where recent NNSA investments have significantly increased mission capability. 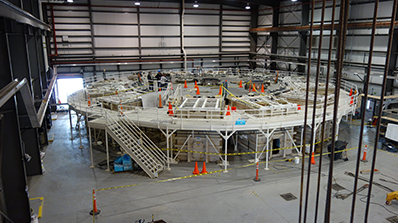 NNSA is also supporting the NNSS mining capabilities for the U1a Complex Enhancements Project and is expected to fund a follow-on Building 6-922 reconfiguration support project. 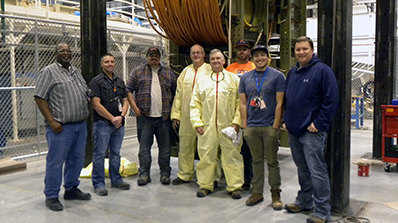 The Atlas Transition disassembly project was complex, but that is nothing new to the Site’s employees (some of whom are pictured below) who are responsible for such work. Their experience and ability to adapt the project execution plan as the disassembly progressed allowed them to complete the project well ahead of schedule and under budget. Mike Ponce, Aaron Bartholomew, Nick Carmona, Josh Sargent, Royal Moulton, Damon Plant, Patrick Phan, Jason Meshell and David Soto. Not pictured: Stacy McReynolds. Discussion on the GPS antenna location. Recently, the U.S. Department of Energy (DOE) Aerial Measuring System (AMS) conducted a series of joint surveys with the Norwegian Radiation Protection Authority (NRPA). The goal was to compare the responses of the two agencies’ aerial radiation detection systems and data processing techniques. These surveys were flown over selected natural background areas near Las Vegas and varied radioactive surface contamination areas at the Nevada National Security Site (NNSS) including Areas 3, 8, 11 and 30. For the comparison, both teams used their agencies’ deployable aerial radiation detections systems. Both systems were flown on the DOE Bell 412 helicopter with AMS' in externally mounted dedicated pods and the NRPA system inside, mounted to the helicopter floor. This was AMS' sixth joint survey with international partners. The first was conducted in 2007 with the French Alternative Energies and Atomic Energy Commission Helinuc. Subsequent surveys have been conducted with the British Atomic Weapons Establishment (AWE) in 2010, Israel Atomic Energy Commission in 2013, Natural Resources Canada (NRCan) in 2014, and another French team from the Institute for Radiological Protection and Nuclear Safety (IRSN) in 2017. In parallel to the joint survey, AMS hosted an advanced data analysis workshop for selected countries or organizations: Norwegian NRPA, French IRSN, Taiwan Atomic Energy Council and the Canadian NRCan, with observers from the International Atomic Energy Agency (IAEA) Response and Assistance Network (RANET). Workshop participants performed analysis of data collected during joint surveys under the supervision of AMS data scientists using AMS techniques. The data workshop was of special interest to RANET personnel, as it provided an opportunity for a group of international subject-matter experts to work together analyzing and producing joint products, much like what would be necessary in the event of an international request for assistance rendered by the IAEA. Participants in the advanced data workshop hard at work. Both events were sponsored by the NNSA Office of Nuclear Incident Policy and Cooperation to help improve and validate AMS methodology. According to the Office's director, Ann Heinrich, engaging international partners has tremendous return on investment in supporting long-term national security goals, establishing strategic relationships with regard to radiological/nuclear terrorism threats, enhancement of technical tools, policy development, and practical approaches to strengthen U.S. (and global) preparedness. The data collected by each team will be included in the final report written by NRPA, with the first discussion of results scheduled for June 2018 during the 6th AMS International Technical Exchange in Las Vegas, and final report discussion scheduled for spring 2019, with the U.S. delegation visit to NRPA. A roadrunner spotted at the NNSS. Springtime is a good time to find a safe, cozy home for your new family. Especially if you’re a roadrunner at the NNSS. 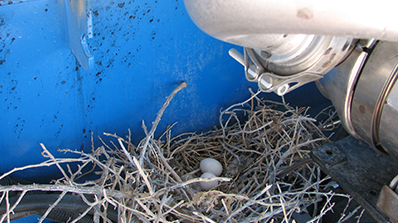 In May, some workers at the Site's Device Assembly Facility (DAF) noticed that a family of roadrunners was nesting in a forklift that serves the building. Because the NNSS community cherishes the wildlife that call the Site home, and personnel have been trained to not disturb active nests, they left the nesting birds alone. “We have ways of protecting the species while getting the work done,” says Derek Hall, an NNSS senior scientist in Ecological and Environmental Monitoring. Roadrunners typically nest about three to nine feet above ground, from spring to mid-summer. What better place than a metal behemoth like a forklift? 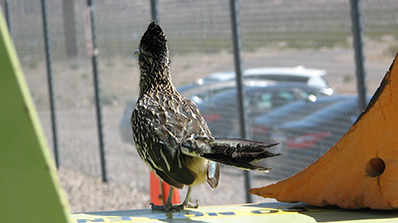 Roadrunners not only like the DAF, they’re hanging out elsewhere—lately, at the U1a Complex. Hall also mentioned that in Area 5, one of the operators, during his routine inspection of equipment, found two roadrunner eggs in a lift’s engine compartment at the Radiological Waste Management Complex (RWMC). One of the nests found in Area 5. Hall says that he’s seen more roadrunners the last couple of years – about eight – at the Site than in his 20 years there, from Mercury to Rainier Mesa. Last year, two nests were found near the RWMC: one halfway up a ladder and another in a pile of pallets about three to five feet off the ground. Roadrunners have adapted techniques to kill and eat rattlesnakes. Seems these roadrunners have the Site's back and know the NNSS employees have theirs as well.